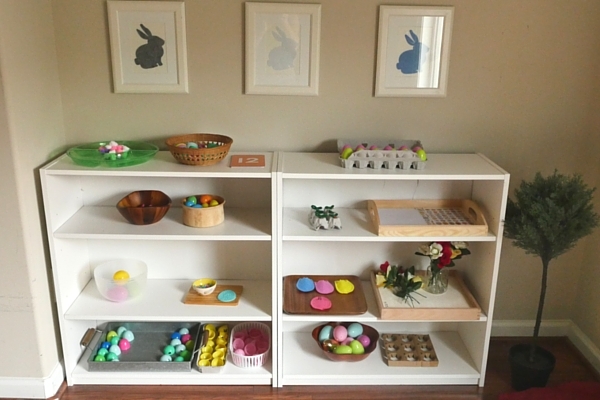 With Easter just one week away, I wanted to put together some Easter activities for Alexander (age 2 years, 9 months). I looked around online, through Google images, Instagram, and mostly just in my own head. Finally I came up with more than 15 different ideas that are Easter-themed but also have a learning aspect. I wasn’t able to use all of them because (a) I ran out of eggs! and (b) I ran out of space on my schoolroom shelves. 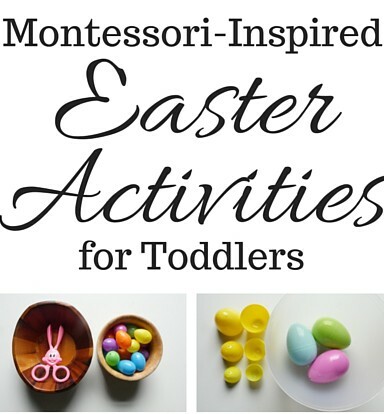 Here are 15 Montessori-inspired Easter activities for toddlers. I’ve got some links along with each picture and description if you’re interested in buying the products to do it yourself. If you use that link to buy something, it doesn’t cost you anything extra; but I get a tiny bit of commission from Amazon, which helps me fund future projects and activities. The sounds are distinctive enough but can still be confusing for a toddler. The rice and oats are similar. The felt balls are nearly silent, as is the crumpled piece of paper. And the plastic turtle and erasers sound a bit similar. This idea is fairly simple and can be used for lots of things. 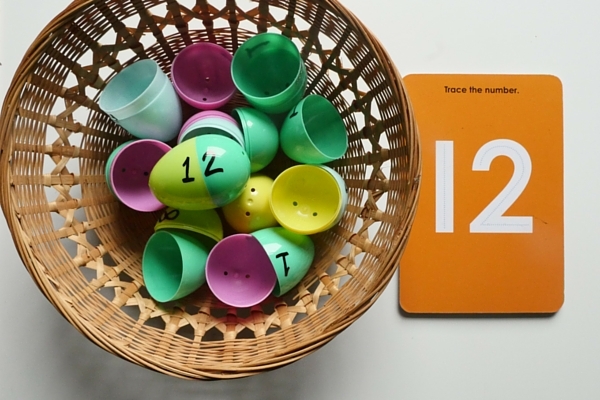 I took the numbers 10-19, since they all started with the number 1, and I put one number on each half of an egg. So 1 and 2 make twelve, for example. I put all of the egg halves into a bowl along side some tracing cards . He will pick a card, then find the halves that go together to make that number. NOTE: You’ll want to use more than just a regular Sharpie (or you can paint over the Sharpie with some clear fingernail polish); otherwise it will rub off. I used this Sharpie Pro . 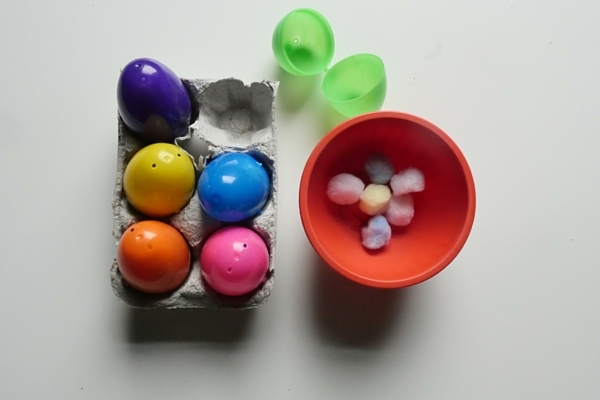 For this activity, I used jumbo Easter eggs . 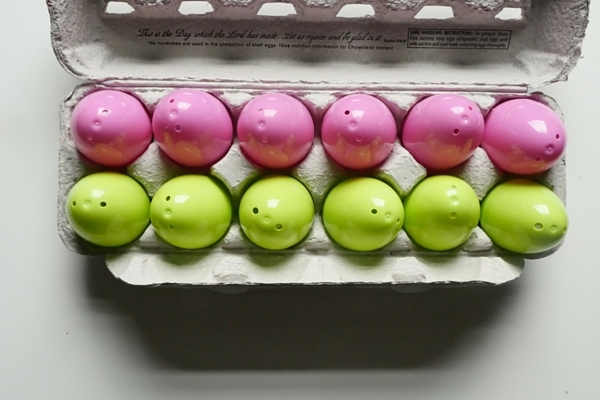 Inside each egg, I placed 1-9 little rabbit erasers. I found a cardboard egg container that was going to be thrown away, and I cut it down to a 3×3 grid. I labeled it with the numbers 1-9. 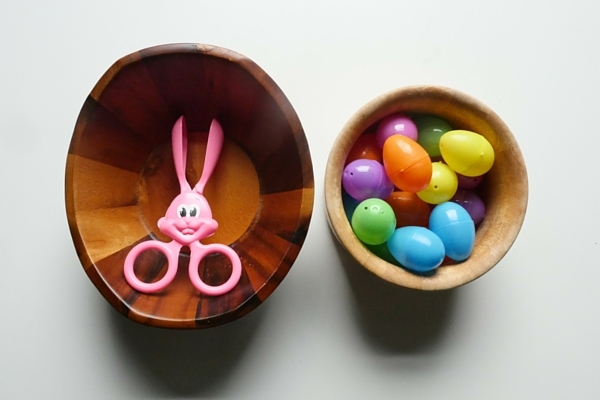 Alexander’s task is to open each egg, count the erasers, close the egg, then place the egg in the corresponding hole. NOTE: All of my bowls, I found for under $2.00 at the local thrift store (Goodwill specifically). The image below shows most of the activity but not all. 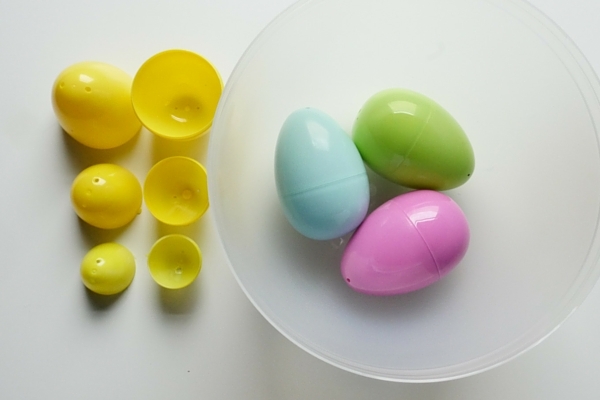 All together, there are 52 egg halves that can be matched! In order to make it not so overwhelming, I simply separated these by color. Now, a bigger challenge would have been to swap all the colors around, but I decided to keep the colors the same (for the top and bottom halves). On the top half, I wrote the uppercase letter, and on the bottom half, I wrote the lowercase. Alexander’s task will be to find the matching letters and combine the egg halves. I bought this from Hobby Lobby, and all I did was put the beads in a little bowl next to the egg shape. This is a great practice for fine motor skills. There are a TON of beads, though, and I’m not sure if I want to leave them all out for him or just have about 20-30 at a time. I can imagine a lot of little beads all over the floor… Anyway, he’ll create a pattern, and I’ll heat the final product to set it. This can be done and redone, using the egg shape as the base. It should make a pretty little activity! Window clings are simply stuck to a window. But in order to get to the cling, you have to first peel off the front and back plastic layers! So Alexander will have to peel open each cling, then press it to the window. This was a super simple little craft. I saw it somewhere, a little while back, and had to recreate it myself. When I saw it there were no instructions, so I did my best! 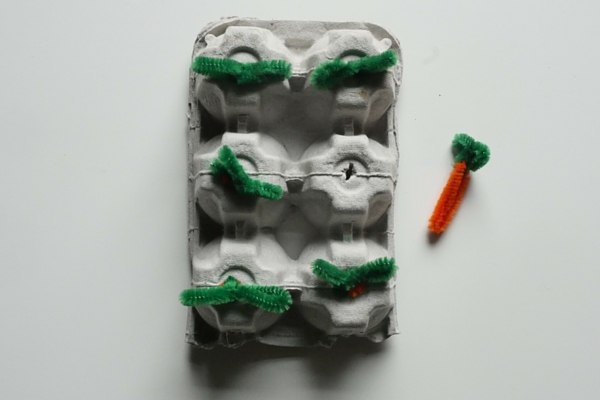 I used orange and green pipe cleaners plus half of an empty egg carton. Trim the egg carton so that when you turn it upside down, it lays flat. Poke holes in the tops (the bottoms, really) of each little cup. I just used a pair of scissors to stab it into an X shape. Cut two orange pipe cleaners and two green pipe cleaners into 3 equal segments each. Fold one orange piece in half and twist the ends shut. The twisted part becomes the bottom of the carrot. Thread one green piece through the top of the carrot and twist to secure it. 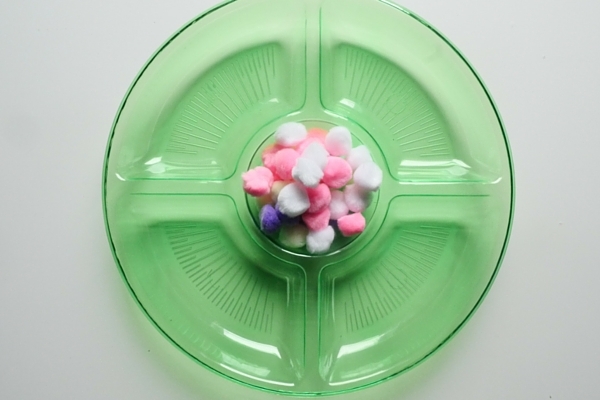 Take the loose ends of the green piece and fold them toward the orange, to create two leaves. Shove each carrot through an X-shaped hole. The task here is to simply tug on the carrot and pull it. I made some carrots a little fatter than others so that they’d be a little tougher to pull out. And once finished, push them back in! 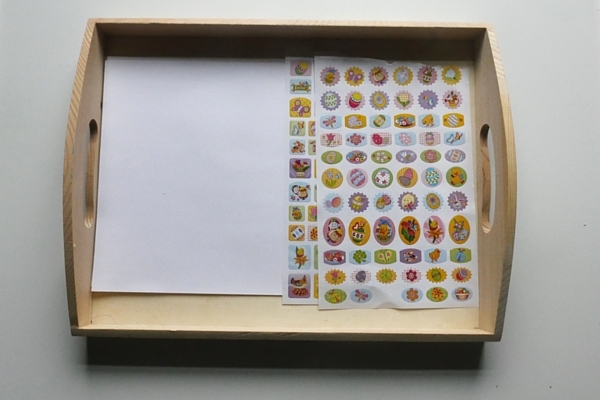 This is a classic Montessori practical life activity. I really should have fresh flowers and water and a watering pitcher and all that. I do want to do that in the future, but for today, for this week, for this theme, it was easier to opt for the fake ones. I found 3 little bouquets of flowers at the Dollar Tree (for $1 per bunch). I cut off each individual stem (they were connected). THAT was a task… if you have some wire cutters, it will be easy. If you do not have wire cutters (like me) it will be more tricky! I used scissors, clamped them shut, and just twisted each stem around and around about 10 times. Then I released the scissors, bent the stem back and forth a few more times, and it finally broke off. It took about 10 minutes to cut all the individual stems. I stuck some of the flowers into a mason jar, and I placed some extras next to the jar. I’ll show Alexander that this is what a bouquet looks like and ask him to make an arrangement for himself. 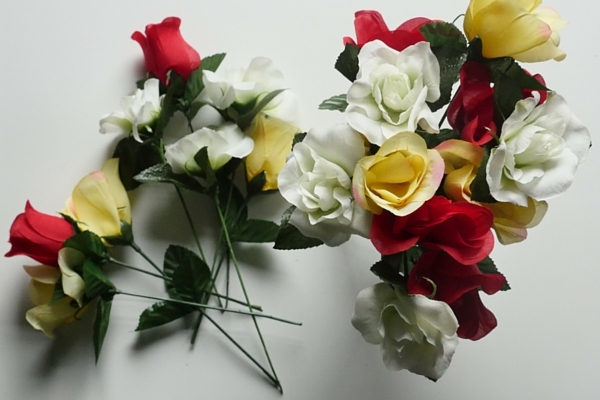 There are 3 colors of flowers. I anticipate that he’ll put all 3 colors together, but he may choose to stick to just one color for his arrangement. Here are those pom poms again! And I used a divided tray that I found for $1 at the Dollar Tree. Here’s a set of them , though, if you just want to get some for future sorting practice (but if you have a Dollar Tree, check there first since it’s cheaper!). I put 4 colors of pom poms in the center, and Alexander simply has to separate the 4 colors into the 4 sections. This isn’t totally Easter-related, but I didn’t have any more tiny Easter-y things! You can use small crosses, or rabbits, or chicks, or eggs. The pom poms are Spring-y, at least. 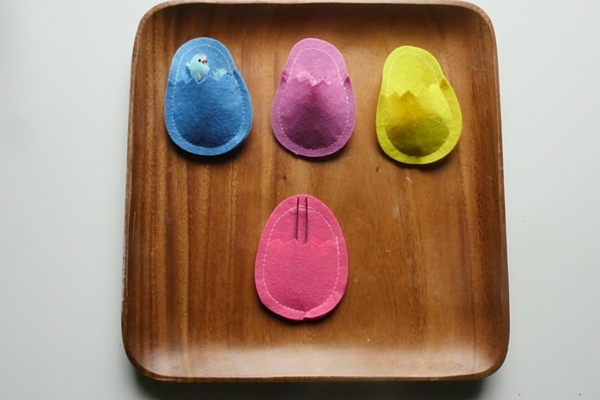 I found these felt egg pouches at Target and these tiny colorful chicks from Hobby Lobby. 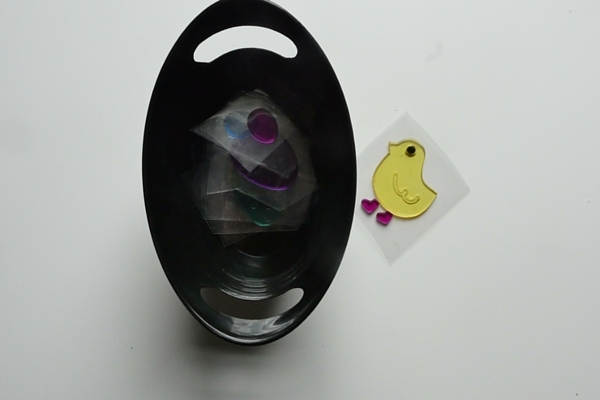 I matched up the colors, placed the chicks inside the matching egg pouch, and I put a set of tweezers inside the 4th egg pouch. I found a giant egg filled with jumbo eggs, at Target. I had some regular sized eggs, but I bought more regular eggs as well as some miniature eggs at the dollar store. 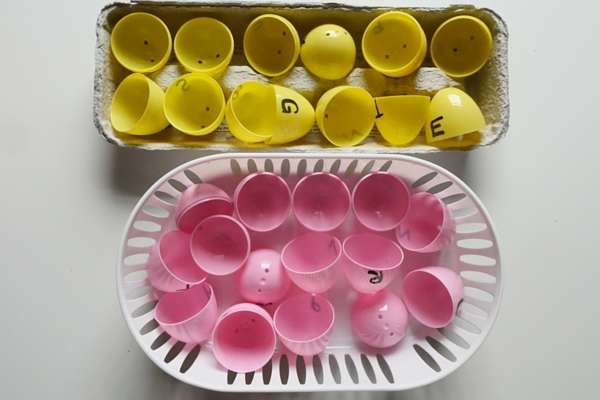 I matched colors to make 4 sets of nested eggs! I placed them inside of the base of the giant egg. I was really excited about this idea. If we had a router , I would have cut these from a thin piece of wood, sanded them, and stained them. But alas, I used scissors and heavy card stock. I cut 5 eggs to be the same size. Then I cut them in half in 5 different ways. Alexander simply has to match them. If it proves to be way too easy, I’ll make a new set that is a variety of similar jagged cuts. I saw these bunny tongs at Hobby Lobby. 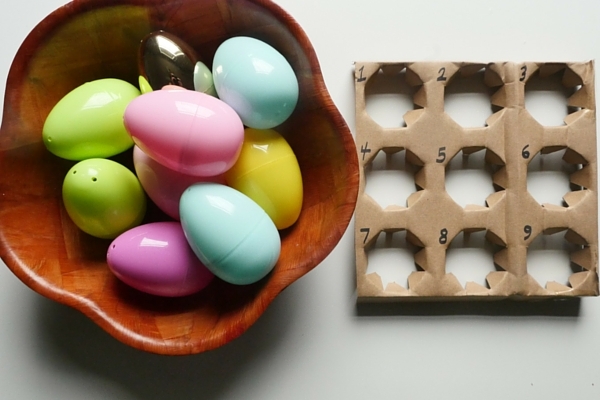 They are perfect for picking up the tiny eggs! Stickers are good for fine motor skills! I make it a little easier by peeling away everything but the stickers. Since I came up with more than I expected, I’ll leave these trays available for two weeks instead of just one. I found some bunnies that I put in our frames for the time being. What About the Meaning of Easter? We are Christian. And I do have a few crafts related to the Easter story planned. One big project I hope to finish this week is a children’s book of the Easter story that is in the style (of writing and illustration) of Eric Carle’s The Very Hungry Caterpillar . I have the text written. I just need to work on the simple illustrations and put it all together! Pin This Blog Post by Clicking HERE, or click the image below. I should really start thinking of these ideas BEFORE I want to do them. I’ve been staying up until midnight recently, just racking my brain for ideas for the NEXT day. Seriously. I need to work on this! Anyway, as usual, I peruse Instagram and (sometimes) Pinterest and Google images, then I take what I see and make it work for Alexander. Sometimes I take an idea and just totally copy it, but I usually tweak it so that it works for us. He likes certain things, so I want to cater to them, to help him grow and stay engaged. 1. From Busy Toddler (busytoddler.com and also on Instagram), rainbow rice. To make this, I poured 1/2 cup of plain white rice into each of 6 small plastic bags. Then I squeeze 4 drops of food coloring in each bag. In one bag, it was 4 red drops. In the second bag, it was 2 red, 2 yellow to make orange. Then 4 yellow, 4 green, 4 blue, and 2 red+2 blue. Alexander and I took turns shaking the bags vigorously, to dye all of the rice. I poured each bag, carefully, into a large metal tray, to create a rainbow. I set it by a window, in the sun, to dry for an hour or so. Then I offered Alexander several types of spoons to practice scooping! Afterward, he helped me by using a measuring cup to scoop the rice and pour it into a bag, to use again another day. 2. From Busy Toddler again (she’s awesome, by the way! ), a green bath. 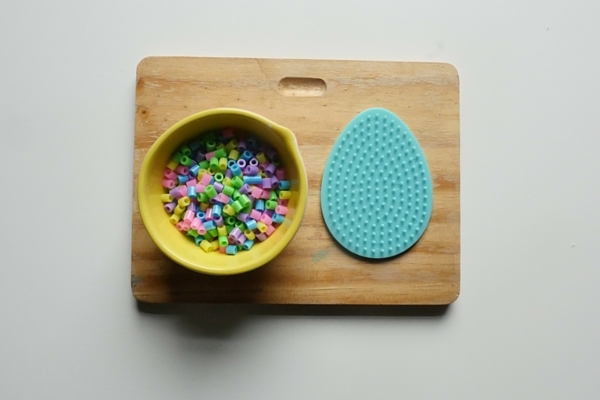 I found all the green water-safe toys I could, placed them in the bathtub, and filled it up with water along with one good squeeze of food coloring. It didn’t make a mess, as you might have been wondering! 3. Stickers + Matching. This was SO easy to put together. First, I stuck plain white stickers to a sheet of printer paper. Second, I found an image of a shamrock on the internet and printed it onto that piece of paper. Third, I wrote capital letters on the stickers. Finally, I removed the stickers one by one and wrote the lowercase letter underneath. Voila! Easy peasy. Alexander simply had to match the letters and place the sticker where it needed to go! 4. Banish the Snakes. One of the many legends surrounding St Patrick’s Day is that St Patrick drove all of the snakes out of Ireland. “Since snakes often represent evil in literature, ‘when Patrick drives the snakes out of Ireland, it is symbolically saying he drove the old, evil, pagan ways out of Ireland [and] brought in a new age.’ “ (If you’ve never read it, you should read some of the history/legends surrounding this holiday, like why we use a shamrock, wear green, etc. It’s interesting!) This activity is “banishing snakes” by pushing the pipe cleaners into a container, therefore making them disappear. For Alexander, at just 2.5 years, it’s just practicing some fine motor skills. 5. Rainbow Bubbles. Woo! This was fun. I used baking soda, vinegar, and food coloring for this one. In a big plastic bin, I put about six 1/4 teaspoons of baking soda, separated. On each little pile, I squeezed a few drops of food coloring (like in #1). Then I put some white vinegar in a cup along with an eye dropper tool. Alexander simply drew water into the dropper and squeezed it onto each little pile! 6. Shamrock Painting (NOT DONE). The afternoon got away from us, so this one didn’t happen! But here’s the idea: Mix up some green paint and cut a green bell pepper (that I already had) into rings. Dip the pepper into paint and stamp it onto some paper. The cross section of the pepper is shaped similarly to a shamrock! Today I decided to put together some activities for Alexander that were all related to transferring. During his nap, I gathered lots of container, objects to transfer, and things I could use to transfer the objects. I ended up with more than I needed, and I was able to put together these 8 activities that are focused on transferring (or spooning or scooping). So far Alexander has only explored a few of these. He really loved the balls and the lollipop sticks! We love Eric Carle around here. In particular, Alexander loves Brown Bear, Brown Bear, What Do You See? He has it memorized and reads it back to us most of the time. During his nap today, I decided to make a coloring sheet that goes along with the book. I simply went to the last page and traced the different animals onto a single sheet of paper. I made several copies of it, using our printer/copier. A short enrichment style activity! If you feel like I’m better at tracing than you are, you can save the image below and print it! Or just do what I did and trace them. Mine are a bit sloppy because I was in a rush! I have seen several tutorials for a DIY fishing game, but I wanted to create my own! After completing this project, I see where I could have saved a little time and where I messed up here and there. I’ll share that “inside info” and give you some tips on how to do this yourself. Additionally, unlike other tutorials I’ve seen, this can be used for more than just numbers. I’m not super crafty; I always burn myself with my hot glue gun. I only have a tiny sewing kit, and my stitches are crooked. I don’t have a lot of tools that might have made this easier. But when I come up with a project idea, I like to use as much of my own stuff as possible, to keep the costs low. Finally, I apologize if I dumb this WAY down for some folks. I want to make it super clear so that it doesn’t seem overwhelming. I created two stencils: one for the fish and one for the pocket. 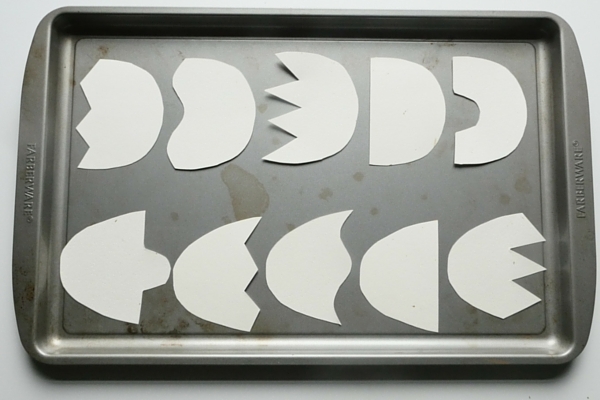 I traced the fish 10 times per sheet of felt (to make 40 fish shapes, or 20 fish). MY FIRST MISTAKE: I freehanded the fish shape, so it wasn’t perfectly symmetrical. Because later, I used 2 fish sandwiched together to make one fish, they didn’t line up perfectly. I had to do a lot of cleaning up later, and most of them aren’t as pretty as they could have been. What I could have done instead was use my freehand fish stencil, trace it once, then flip it over and trace it again. That way, they would have been mirror images of each other. That would have helped tremendously later on! I created the pocket stencil by placing part of the card stock onto one of the fish, to be sure it would fit nicely. Then I used that to create 20 pockets. I thought about making 40, but I like the way they turned out, with the gills on the other side. Cut out all of the fish. I had to use 3 different pairs of scissors, meant for different things (like for hair, for fabric, and for paper). I know you’re not supposed to do that, but darn it, these things were a pain to cut out! I think if I’d had one great pair of super sharp scissors, it would have helped! DON’T CUT OUT THE PLASTIC POCKETS! Cut around them so you’ve got a little edge. That will make it way easier to sew them on later! TIP! When you’re cutting the plastic, just get the cut started and then push the scissors forward. They glide right through. It’s much easier than actually cutting the whole time. Turn 5 of the fish over so you can’t see the Sharpie outline. Place one pocket square onto the side of the 5 fish. Sew it on, INSIDE the black line. Trim the black line using super sharp scissors. Cut some of the extra felt into small, curved pieces. Take the other 5 fish. Hot glue (or sew) the gills onto the non-Sharpie side of the fish. Be sure to mix up the colors! Flip over the 5 fish that have the pockets. Glue one washer onto that side. Make sure it’s not totally on the edge; otherwise you won’t be able to sew the fish closed. Place a gilled half on top of the pocket half. Repeat that for all 4 colors of the felt! You should have 5 fish of each color. I used a font on my computer to make the numbers 1-20 that I liked. Then I changed the settings so they were outlines only. I printed those, cut them out carefully (using an exacto knife), laminated them, then cut out the numbers into a shape that would fit inside the little pockets. I inserted the numbers into each of the pockets. The last thing I needed to do was make the fishing rod. I got a wooden dowel at the hardware store, but you could just as easily use a stick from your hard! I tied the string to the ring-shaped magnet. For added strength, I put a dot of hot glue on the string before pulling it tight to the magnet. Then I tied the string to the dowel. Have your child pick up each number, in order. You can just have 1-10, or 1-5, or 11-20, or even odds, evens, or multiples. In each pocket, put a picture of an animal. Call out a fact, or an animal sound, and have your child pick up the appropriate animal. Using numbers again, call out “What is 2+3?” and your child would have to pick up the “5”. The ideas are countless, really. I wanted to use pockets so that I could this game setup for a LOT of things. It did take quite a bit of time, but it will hopefully last quite a while! If you would rather just buy something like this, you can pick up a similar game from Melissa & Doug (affiliate). If you’re crafty, or like making things from scratch, then try mine!